We followed the road in front of sushi stall to Jeju Town after savoring dinner. Try to guess what is this shop? Based on the information of the billboard, perhaps it's a karaoke. The roads around Jeju Town were flooded with vehicles. Shops along the street were brightly lit up. The shining light had brightened the sky of Jeju night. There is a 7-11 politics party in Malaysia. 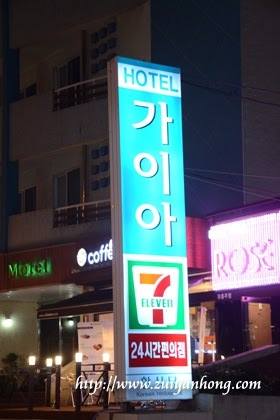 Coincidentally, a 7-11 Hotel is also available in Jeju. Actually that's a 7-11 Convenience Shop in the Gaia Hotel. ABC-Mart is a shop selling branded shoes. Beyond branded shoes, this shop also sells other sport products. 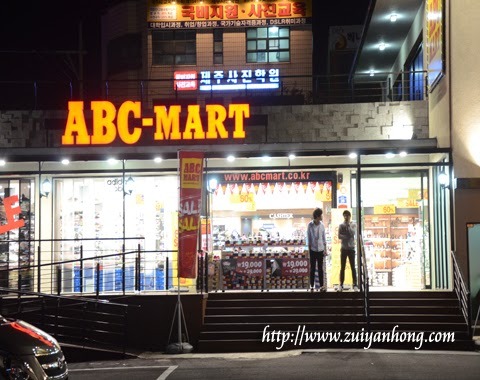 There is a larger ABC-Mart at Myeongdong, Seoul. Arriving at Tom N Toms Cafe, we stopped to take a few shots with my Nikon camera. The cafe is at the other side of the street. If not we would like to drop in to have some coffee.